More people are choosing to live in the cities but that doesn’t mean you have to miss out on the joys of gardening. Polytunnels ensure that everyone can give gardening a go, even with the smallest outdoor space. You may not have thought that apartment living or a pad in the city would mean you could exercise your gardening credentials but, ask any experienced gardener and they will tell you that you can garden anywhere. From windowsill pots to sacks of potatoes on the balcony, you can have an urban garden that offers colour, scent, food and a haven from busy urban life. First, you need to be clear about how much outside space you have to give over to your urban garden. Some people have a pleasant enclosed backyard space whilst other urban gardeners seem to perform horticultural miracles on an outside balcony. The amount of space you have will dictate how many plants you can squeeze in but you also need to look at these important factors too: sun and shade. SUN helps your plants to grow by performing an unseen reaction in the leaves, plants and flowers that help them to grow. Some plants need more sun than others. Whilst some plants are sun worshippers, others like it some of the time but don’t like to sit out in it all the day, whilst other plants don’t like sitting in sun at all. SHADE is welcomed by many plants but even in the shade, the temperature can be on the high side. Essentially, understanding in which direction your urban garden faces will help determine what kind of plants will thrive there. Exposed gardens need more protection than those in more or less constant shade. You may have a small urban garden that comes complete with borders and flowers beds. Or, you may choose to plant in containers. There are many options from ceramic pots to plastic tubs and troughs or, you can always create your own using recycled and reused boxes and materials. Drainage can be an issue – and so placing items such as large chunks of polystyrene or gravel can help the soil to drain, remain moist but without plant roots sitting in water-logged soil. Some plants are more tender than others, so you will need to take note of the kind of soil each plant likes. They dry out quickly – and that means watering them before you bob off to work in the morning and when you come home at night. And for some plants this doesn’t mean soaking them but more of a light sprinkling. The urban garden can be an oasis of calm for you after a busy day, but also a hive of activity for bees and butterflies. It can also be a source of food for you too. Who would have thought that potatoes would be happy growing in hessian sacks on a flat balcony or that tomato plants would enjoy the soft, gentle breeze of your backyard? But like all gardens, plants need the right conditions to thrive and grow so even if you have acres of garden, if the soil is too heavy, waterlogged or sandy, then some plants will just not thrive. And the tools open to use by ‘rural’ or allotment gardeners are also available to the urban gardener too. For example, if you want a glut of vegetables this spring and summer, why not invest in a mini polytunnel? Extending your growing season by several weeks, a mini polytunnel will fit an urban garden or any small garden and, when not in use, can be easily stored. The one thing we like about an urban garden is the many ways that it adds to the enjoyment of living in your home. Styling a garden out means a double treat – not only do you get fruits and veggies from some plants, as well as colour and a pleasant perfume scent hanging in the air, you also get something that looks pleasant too. 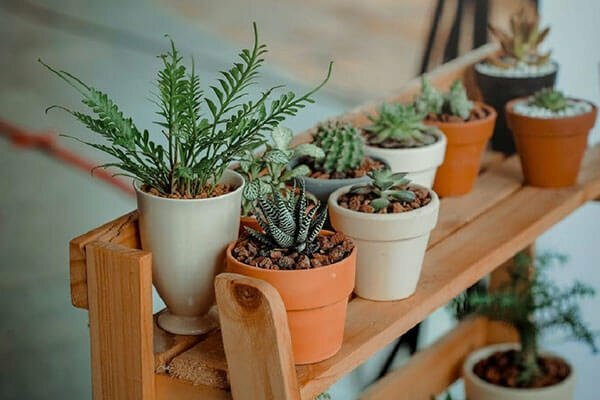 From using wooden ladder’s to an old bookcase, your potted plants will thrive happily on shelving on the balcony, in the back garden, front garden, porch… you name it, no matter what shape or size your urban garden, it will be a pleasant and bountiful spot. This is especially true if you use a handy mini polytunnel. It’ll keep your space clean, cool and stylish. Which Way is Your Garden Facing?